The Stouffville Spirit have a vacancy at the head coach position. Last season, Rob Acton came in to run the young squad. He had played for the Spirit from 2010-12 before scouting for the Western Hockey League’s Swift Current Broncos. Acton coached the Uxbridge Bruins Junior ‘C’ team in 2017-18 before stepping behind the bench of the Spirit last season to guide the young squad. He has accepted a coaching position at The Hill Academy in Concord, where Acton will coach the under-18 team for the private school, working under Doug Orr, also a Spirit grad. 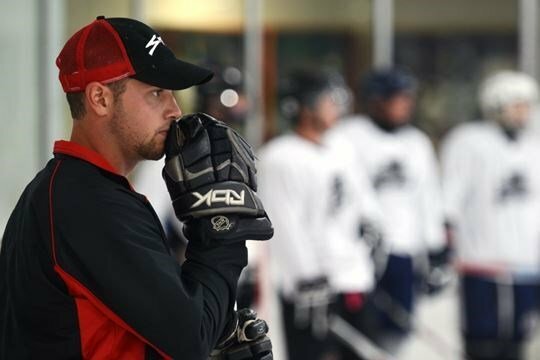 This has opened up the head coaching position, one which Stouffville general manager Kenny Burrows hopes to fill in the near future. Those who are wishing to apply for that position can reach him at kenshockey@hotmail.com. Photo courtesy of the Stouffville Spirit – Rob Acton, the former bench boss of the Spirit, will now be coaching at The Hill Academy in Concord.